Polling is being conducted this week to evaluate the strength of a bipartisan ticket for governor. 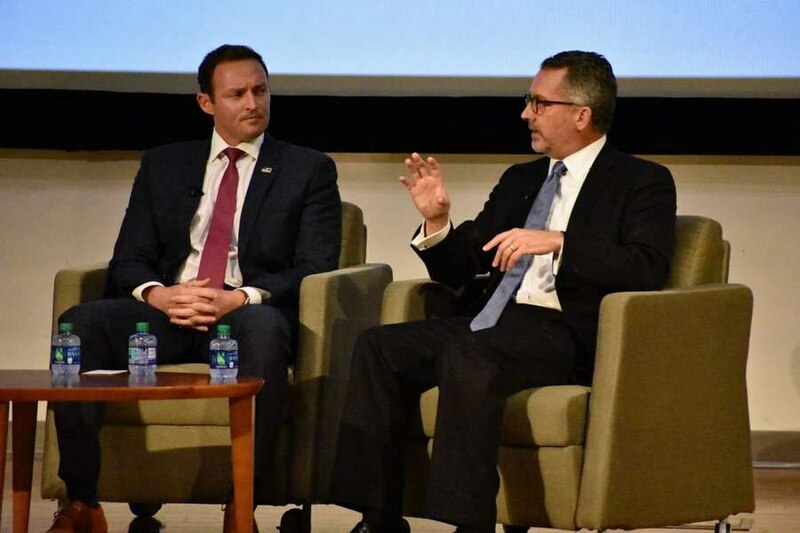 Former Congressmen Patrick Murphy, left, and David Jolly sound off on the gridlock in Washington, D.C., during a forum at USF in October. For those who complain that politics is too political, two former Florida congressmen are floating an unprecedented antidote: A bipartisan ticket for governor. Patrick Murphy would enter the Democratic primary and if he won the nomination, would name as his running mate David Jolly, a Pinellas County Republican who has become a fixture on national news shows for his opposition to President Donald Trump. "I have to admit, it's intriguing," said Renee Joslyn, a 61-year-old registered Democrat from Miami, who received a call Monday from a pollster asking about Murphy and Jolly and the political climate in Tallahassee. "I'm old enough to remember when it wasn't as ugly as it is now." Joslyn prefers Gwen Graham, one of four Democrats officially in the race. And Murphy, who has some statewide name recognition after challenging Sen. Marco Rubio in 2016, cautioned that the idea is in its infancy. Supporters asked for polling, he said, and he agreed to test the air. Murphy, 35 and the son of a wealthy South Florida builder, would seek the gubernatorial nomination because Jolly, 45, would stand virtually no chance in the Republican primary, where candidates are trying to line up with Trump and strong conservative policies. Jolly lost his House seat in 2016 to Democrat Charlie Crist. But even if nothing happens — "I certainly didn't say yes to actually running!" Murphy said in a text message, declining additional comment — the development speaks to the unsettled race for governor and the unpredictability of Florida politics. It also comes amid a push for a new approach to politics that Murphy and Jolly have played a role in shaping. The centrist former lawmakers have for the past year been on a national speaking tour focused on the dysfunction of Washington and how it can be resolved through de-emphasizing money in elections and fixing the way congressional maps are drawn to maximize partisan advantage. "This is a really hopeful sign," said Ryan Clancy, chief strategist of No Labels, a national group that has worked to foster bipartisanship. He said he wasn't endorsing the ticket but that it suggests an appetite for people who want to govern rather than make political pronouncements. "It sort of tells you these guys are not going to entertain the option unless they think maybe there's a market for it," Clancy said. "Most people are generally center left or center right and yet that is not at all what our elected representatives look like." Florida has seen a surge in voters who register with no-party affiliation and today there are nearly 3.5 million (vs. 4.6 million Republicans and 4.8 million registered Democrats). Still, Florida has a closed primary system so unaffiliated voters must wait until the general election, and Murphy's opponents would likely work to sow doubt among the Democratic base. Jolly's anti-Trump views could work against those attacks but that's an untested notion. "In this super partisan age, the upside of such a combined candidacy is that you attract voters from the other party," said Peter A. Brown, assistant director of the Quinnipiac University Poll, which regularly surveys Florida elections. "The downside is you can lose a lot of voters from your party. "Finding a base might be challenging," he added, "but we are in an era of politics that breaks the old mold." Murphy's interest comes as none of the four Democrats in the race — Graham, also a former member of Congress, former Miami Beach Mayor Philip Levine, Orlando businessman Chris King and Tallahassee Mayor Andrew Gillum — has especially stood out. The candidates offered anodyne responses to the Murphy-Jolly possibility. "After five straight gubernatorial losses and eight years of Rick Scott, Florida Democrats deserve a fresh start and new leadership," King's campaign said. "If they join the race, we look forward to learning more about how the two former congressmen plan to do that not only in style, but also in substance." Graham, who has come under attack from opponents for some votes she took when she represented North Florida in Congress, said: "Patrick and David are both committed public servants and good friends. I have worked with and respect both of them." There was some support on social media but other people said it would hurt Democratic chances and they question the viability of Murphy, who served two terms in Congress and was soundly defeated by Rubio. Jolly confirmed he's been talking with Murphy about the idea and said it was not to suggest either side had to abandon principles but rather to pledge to find common ground. "You have to recognize that Donald Trump tapped into anger, but I don't think his approach has been one that has healed that anger or has bridged the divide," Jolly said. "The opportunity here is not to suggest a ticket of moderates. I think that we're speaking to what nobody else is, the ability to work together in a bipartisan way."